First, I should mention that I'm pretty sure this is the most expensive skein of yarn I've ever purchased, and it was WORTH EVERY PENNY! So smooth, so wonderful to knit - seriously, I would take a bath in the stuff if I could afford it. Luckily, you don't have to use this luxurious of a yarn to make this pattern pop - any heavier weight worsted should do. But perhaps the best thing about this pattern is that it's a pretty simple knit that still yields a lot of graphic appeal. Or in other words, you won't have to put in a lot of work in order to end up with a hat that you'll be pleased with. Clip tail of yarn, thread through final 5 stitches and pull tight. Thread to inside of hat and knot. Tuck in ends. Perfect timing to cast on for a new hat. It was so cold and snowy today, that I had to grab a hat that I knitted for my husband to put on my head. I Love the pattern and your color choice. This one is for me (or until my Mom sees it). Glad to hear you like it! :) We've had snow off and on all day too... so you're right! It's a perfect day for a hat! I just finished this hat in hot pink. I love it. Another day of freezing rain followed by snow. Perfect day to cast on another hat. Thanks again. Need to knit myself another hat. The temperature this morning was 9 degrees and my head was warm and toasty until my Mom saw the hat. Now she is wearing it. She is 91. Ha! Sounds like you made a winner!!!! and the colour is cool too. I thought this color was very pretty. And the yarn is so soft!! Is small meant for a child or is it small adult? 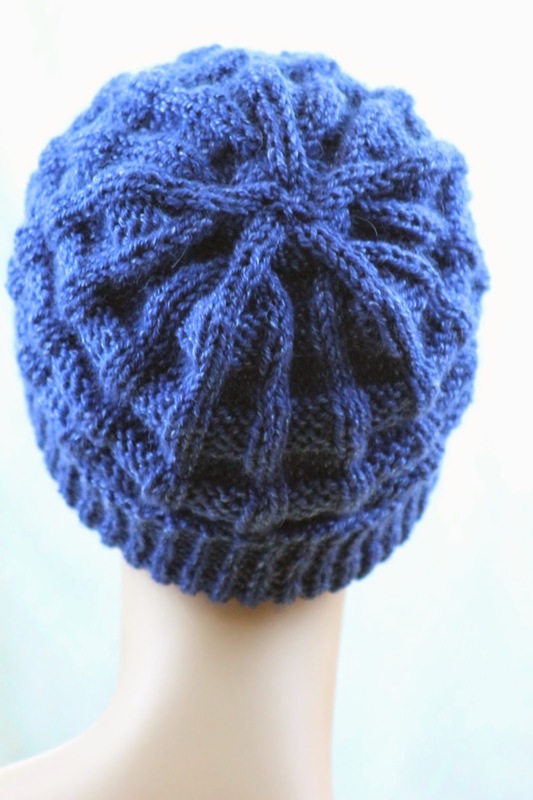 It's an adult small, although it would be suitable for a teen or even an older child (since the hat is slouchy and has enough negative ease). You could also turn it into a toddler's hat with yarn gauged at 20 stitches = 4 inches (and the appropriate sized needles), or a small child's hat with yarn gauged at 19 stitches = 4 inches (and the appropriate sized needles). Just had an 'aha' moment. A misinterpretation on my part of ssk. Thank you for your prompt reply. Thank you for the pattern. I just finished my hat and am really pleased with it. Perfect fit. thank you so much for this adorable pattern. I love it. This is so pretty! I was looking for a pattern that was fast and easy to work, but still look pretty and yours showed up :). Thanks a lot, Gretchen! I'll be using Expression Fiber Arts Pearlescent Worsted in colorway Seattle at Night (a gorgeous navy blue). I think it look great with this pattern. 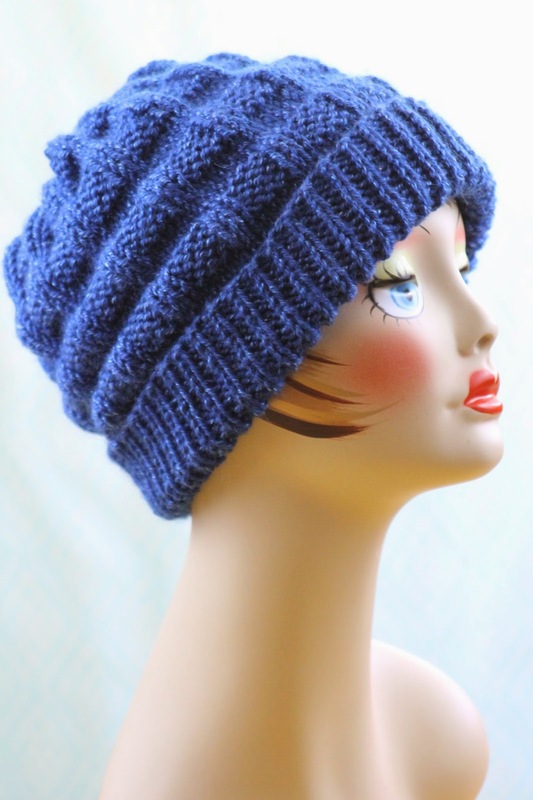 I love the pattern and have made four hats so far; two for my grandchildren, one for my daughter and one for me! Thanks for the pattern! Due to arthritis I cannot use 16" circular needles. I use Magic Loop for hats. I understand the Belt Welt Hat up to Decrease Row 5. Could you please give me instructions for decrease rows 5-9 using Magic Loop? I'm guessing that it's the stitch slipping on row 5 that's tripping you up (please let me know if I'm wrong). Even with the Magic Loop, however, the idea is the same - you'll take the first stitch of the round and scoot it over to the other half of your Magic Loop, so that it becomes the last stitch. Then, when you reach it again, you'll work it in pattern as the last stitch. I have never knit in the Magic Loop myself, so this instruction may be wrong, but if you're having trouble actually getting it moved I think you'll need to slip/rearrange your stitches to where your first stitch is at the inner end of one of your needles (so it's next to the cable). Then scoot your work up the cable enough that you can pull the cable through one stitch over from where it was previously, to where your first stitch becomes your last, and then slip/rearrange your stitches back into place. Thank you for the quick reply and for the pattern. You're correct that it is row 5 that is confusing. I'm not there yet. I will let you know how it goes. I'm at that point. When I move the first stitch over to the second needle (making it the last stitch) that moved stitch is in front of the last stitch and has not been worked. Obviously I'm missing something. I'm not sure exactly what you mean when you say that it's in front of the last stitch - it should become the last stitch, and it should basically look like you slipped it (the yarn should be behind it like a slipped stitch). As far as your other question is concerned - since row 4 of the decrease was all knitting and decreasing, I'm also a bit confused on this one! I'm sorry! Maybe you can email me pictures at ballstothwallsknits@gmail.com and it will be clearer? can finish this beautiful hat? Thank you very much! This pattern won't be *exactly* the same knit flat, but it will be very very close (the only differences will be in the decrease). I'm happy to help you with a conversion - just give me a few days and I'll get one posted! Perfect, that would be great, thank you. Using a tapestry needle, transfer the final 7 stitches to a scrap of yarn to hold for later. 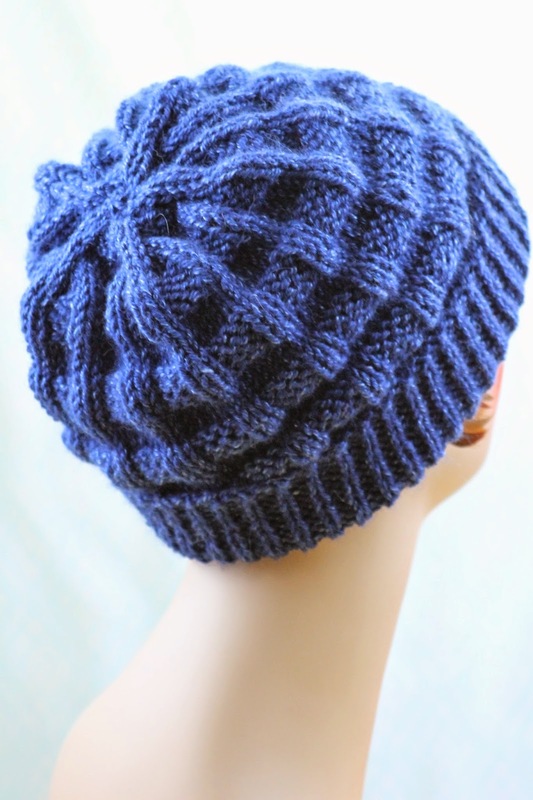 Seam hat from ribbing, and, when you reach top, thread seaming yarn through final 7 stitches and pull tight. 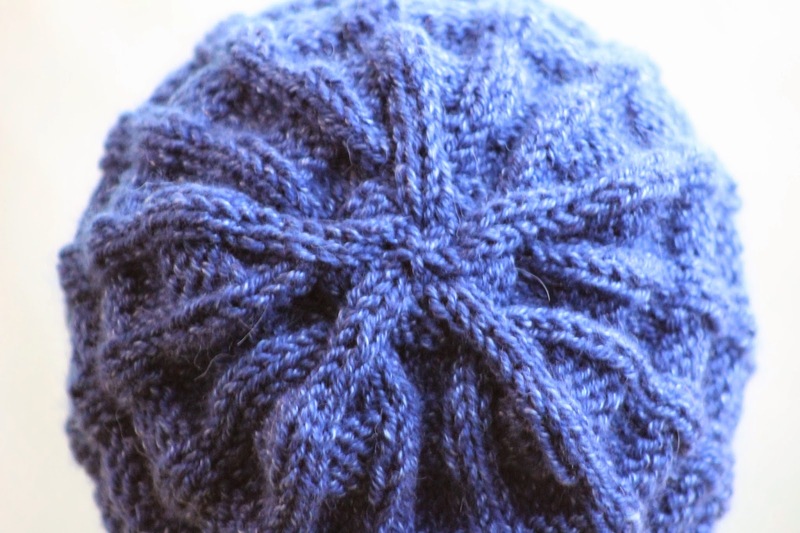 Thread to inside of hat, knot, and tuck in ends. Thank you very much, will try it. Appreciate your help. Hi, it worked perfectly, thank you! You were an angel to go to the trouble of re-working your lovely pattern for the above anonymous knitter. 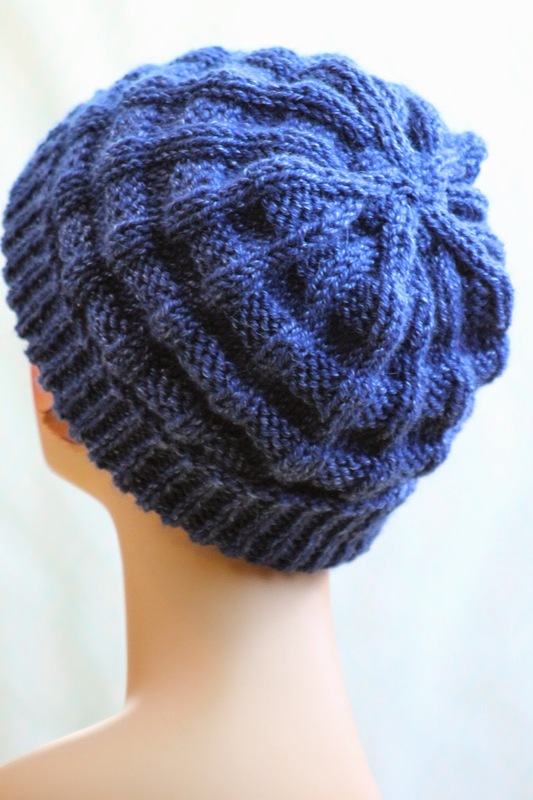 I think your hat is beautiful, but so is what you did for the knitter. I stumbled on your pattern and am knitting a hat for a donation to an organization that collects hats for kids. That sounds like a lovely thing to do! :) And I try to help when I can!!! What a great hat! I'm off to the yarn store today - - - I'll be whipping up a few more for Christmas gifts (plus probably one for myself). Thanks!! Hi! Thanks for sharing so many great patterns. Love them all! 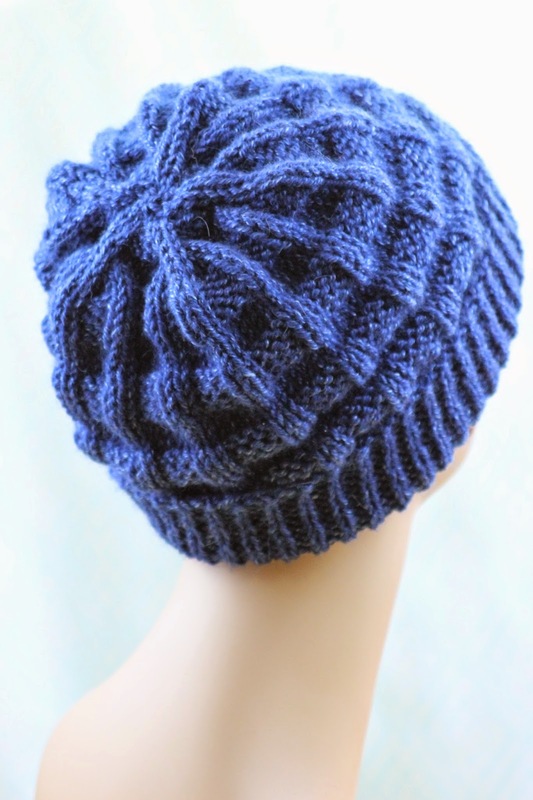 I can knit in the round but really rather knit flat and then seam so I am just thrilled that you have taken time to provide directions to make this hat flat. My son needs a hat he is making me look bad by wearing a cheap ($1.99) hat he bought at a corner store. I know I'm an awful knitting mother I may be shunned by my knitting neighbors. But your generosity has saved me if I start tonight by Tuesday he will not only have a warm natural fiber hat but a matching but not to matchy cowl. I will again be able to hold my head high while strolling the streets of my neighborhood of an evening while yarn bombing the street signs. I truly appreciate your generosity. Wonderful! Glad I could help. :) And I feel your pain - I'm ashamed every time my husband wears his store-bought hat too!!! Glad you like it! :) I am I big fan of natural-looking decreases!!! Thank you for the great pattern and instructions. Enjoyed making this little beauty! If I wanted to knit this pattern with chunky weight yarn instead of worsted, should I cast on fewer stitches (what number do you think might be appropriate? ), use larger needles (like 8s and 10s or 9s and 11s), or both? Let me know if you have any thoughts or if my question is confusing and weird, thanks! Hi! First off, yes, you will need to cast on fewer stitches with a larger needle, but it's tough to be exact without more specific gauge information. Do you have a yarn in mind? If so, let me know what the package says about gauge and I can help you more! :) Ideally, you would be able to cast on 18 fewer stitches, however, and then the pattern and decrease will both work as written! 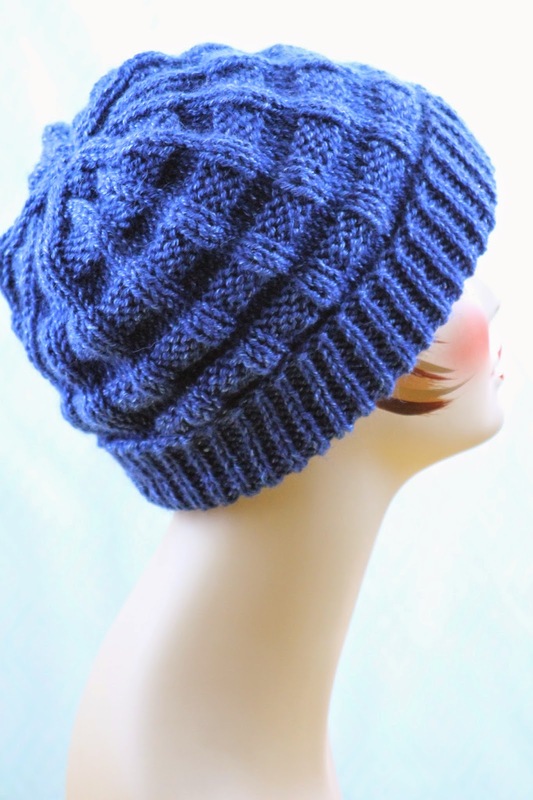 I used your pattern to make a hat out of chunky weight yarn and it turned out great! Thanks for your inspiration. I had to modify the pattern a little to make it work. I used size 9 and 10.5 circular needles for the body and size 10 dpn for the decrease rounds (because I didn’t have size 10.5). Repeated rows 1-6 three times instead of four. The hat turns out to be probably an Adult XS. I used Patons Classic Wool Roving in Frosted Plum. Wonderful, I'm so glad to hear that it worked out well for you! :) And I occasionally cheat with my dpns too - I don't think anyone can tell!!! Wonder pattern and easy to follow UNTIL I got to Decrease Row 9. I am completely lost on this decrease row. It says slip 2 together knitwise - k1 - p2sso. I understand slip 2 together knitwise and then knit 1. How do I do the p2sso?? ?